The dining room seat furniture at Marble House has gilded-bronze structural elements and a cut velvet textile with metallic threads. The Conservation staff is in the process of stabilizing the very degraded textile. The metallic threads are of particular interest. They are made of bundles of silk held together by a flat metal tape applied barber-pole style. 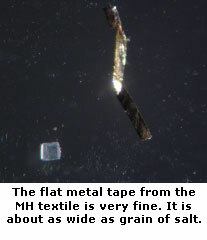 The metal tape is about the same width as a grain of salt – quite small. It is clear that the metallic threads also make great saws – they probably began cutting themselves free of the silk warp as soon as people started sitting in the chairs. Part of the treatment is to secure these flyaway threads. Cross-section microscopy and instrumental analysis reveals an interesting technology. The metal tape started out as thin copper wire, which then received a rather thick coating of silver. The threads look gold, so the silver was possibly gold-gilded using electroplating methods. At some point during the process, the round wire was rolled flat. There are miles of this particular material, and its manufacture and application to fibers deserves further study. 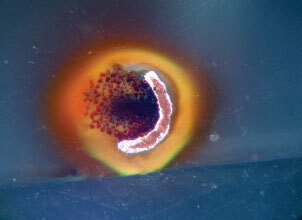 A small piece of the metallic thread was embedded in epoxy and polished. The cross-section at 200x (above middle) shows the silk ends and the structure of the metal. There is a pinkish metal core and a silver colored envelope. We expect the threads to look golden, but if there is gold present on the metal, it is too thin to be seen at this magnification. These photomicrographs were taken by Jeff Moore, Preservation Society Chief Conservator, using a Leica DMLM optical microscope. The instrument was made possible through a gift by the McBean Foundation. Elemental analysis using a scanning electron microscope confirms the materials: copper, silver, and gold. The SEM is sensitive enough to pick the gold right up. The analysis was performed by Xian Zhang, Director of Analytical Services at Williamstown Art Conservation Center, of which the Preservation Society is a member institution. Stabilizing the threads on one of the dining room chairs.